In a heartbreaking Oct. 9, 1954, letter from Yankee legend DiMaggio, her second husband, he begs her to come back home three days after she announced to the world that she was divorcing him. 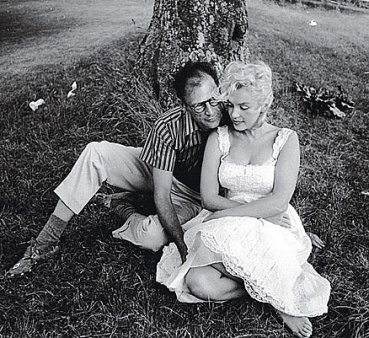 "Marilyn, I keep reading reports about you being sick and naturally I'm concerned … I love you and want to be with you. There is nothing I would like better than to restore your confidence in me so that I can help you regain your once healthy self. Take a photo of Marilyn Monroe nearly anywhere in the world and she is instantly recognizable. Ask any stranger on the street who she is and they'll know. Fortunately, to cheer her up, Hugo came to mind, and with a squeal she runs to the car, calls me to join her, and we’re off to get Hugo, who was getting a check-up at the local kennel. One could never tell by looking at him whether or not these sudden reunions pleased him. His face would mask every emotion; like a great actor he kept you guessing. At times—I had seen this reunion often—he would almost smile, but a stiff upper lip got in the way, leaving Hugo with nothing, absolutely nothing. a link was added: HOW MARILYN MONROE ALMOST DERAILED "SOME LIKE IT HOT"
a comment was made to the poll: Do you think she was murdered?